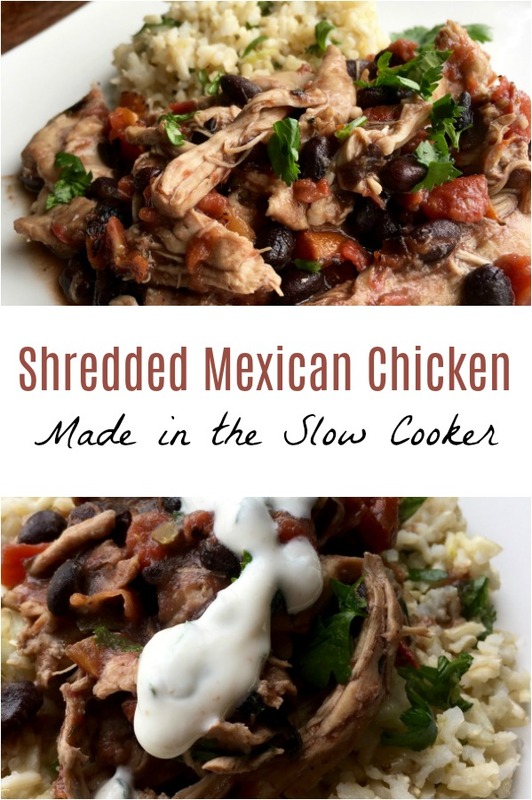 Slow Cooker Shredded Mexican Chicken Recipe | How Was Your Day? I am always looking for new ways to make chicken. While it’s totally changeable, you can also get stuck in a rut really quickly. This flavorful shredded Mexican chicken recipe is so delightfully easy, and so versatile, that it will quickly become a staple in your home. In fact, it might even become that meal that everyone requests you to bring to potlucks and tailgates. 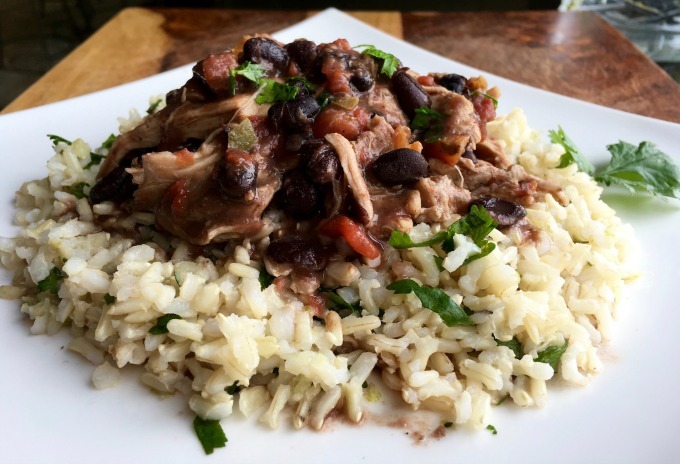 Did I mention that this shredded Mexican chicken has ZERO Weight Watchers Smart Points? OH YEAH! If you want to use chicken thighs, which tend to have a little more flavor, it still only has 6 Weight Watchers Smart Points. Links may be affiliate links. We’ll make a small commission if you purchase through them, at no additional charge to you. A delicious and easy way to make chicken that is oh so versatile. You can substitute chicken breasts for the thighs as well. Add chicken breasts to bottom of a 5 or 6-quart slow cooker crock. Top with tomatoes, black beans, garlic, jalapeno pepper, liquid smoke, cumin, chili powder, smoked paprika, oregano, and cayenne pepper. Season with salt and black pepper, to taste. Stir to combine, making sure the chicken thighs are coated and submerged in the liquid. Cover and cook on high for 3-4 hours or low for 6-8 hours. 30 minutes before it's done cooking, remove lid and shred chicken while it's in the slow cooker with two forks. Stir to combine shredded chicken with other ingredients. Cover and cook for remaining 30 minutes to allow chicken to absorb the flavors. Remove lid and squeeze fresh lime juice into the crock. Add cilantro and stir to combine. Season with additional salt and black pepper, if desired. To serve, spoon chicken mixture over plain brown rice or Cilantro Lime Rice . Top with cilantro-lime sauce if desired. Serve with remaining lime wedges. Enjoy! Isn’t that easy? You basically throw it all in the slow cooker, and set it and forget it. Serve this shredded Mexican chicken with this delicious Cilantro Lime Rice and you’ve got a great meal. It’s so versatile, too. Use it in burritos, tacos, lettuce wraps, or even bowls. Love this recipe? Be sure to share it to save for later!